It had been a awhile since I’d posted a recipe for ñoquis del 29. A monthly tradition that promises prosperity in Argentina and Uruguay, I wanted to start the year off right. Looking for a new recipe, I remembered my first attempt at Meyer lemon gnocchis a couple of years ago. I wasn’t sure how to go about it then so I thought it would be a good time to make a fresh batch. Adapted from Food & Wine, March 2008. I love Meyer lemons, but they’re something so improbably sunny about them that I always forget that they’re in season through the winter. I thought they’d be a great choice for January. Place whole potatoes in a heavy pot with water to cover and bring to a boil. Lower heat to a low boil and cook until just tender, about 45 minutes. When cool enough to handle, peel and force through ricer or food mill onto a sheet pan, spreading in an even layer. Cool potatoes completely. 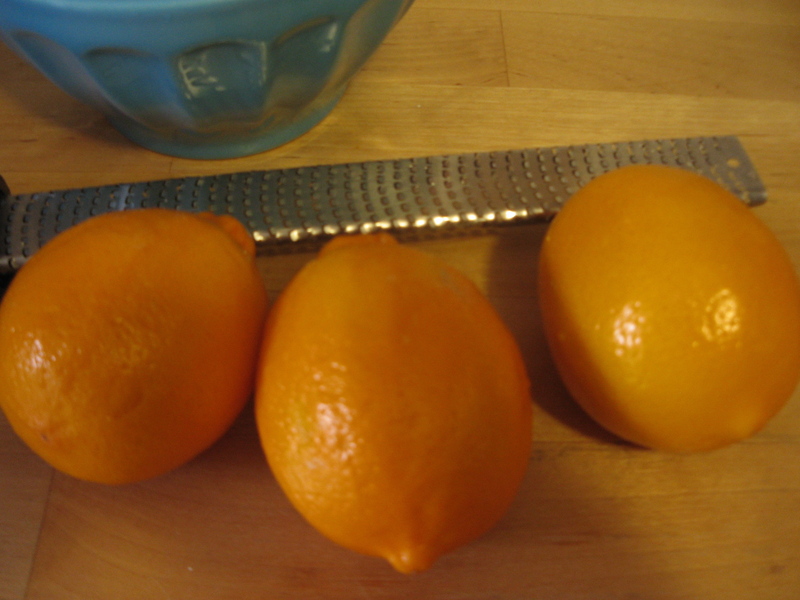 Beat together egg yolks, lemon zest, 1 tsp of olive oil and 1 1/2 tsp salt in a small bowl. On a lightly floured board, gather potatoes into a mound in sheet pan, using a pastry scraper if you have one, and form a well in center. Pour egg mixture into well, then knead into potatoes. Sprinkle the flour over the potatoes and gently mix in until a dough just forms. Dust top lightly with some flour. Cut dough into 6 pieces. 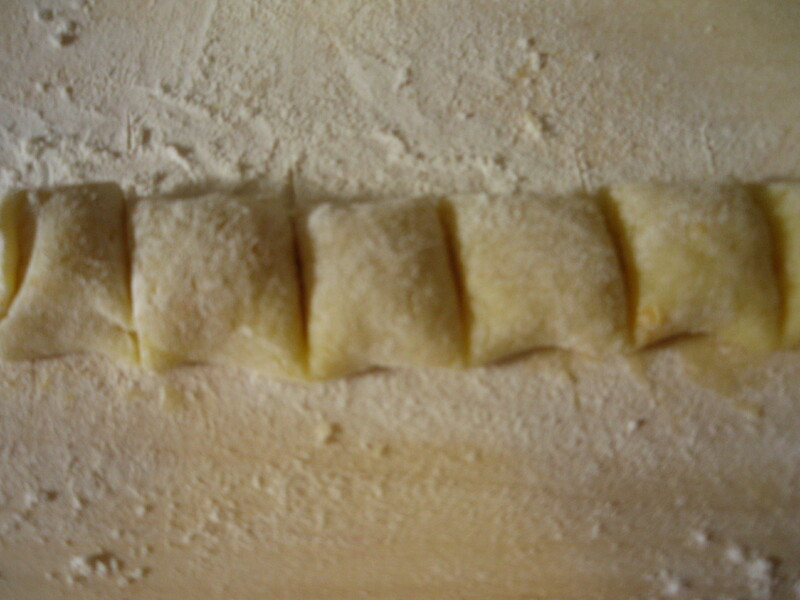 Gently roll each piece into a ball and lightly dust with flour. Repeat with remaining 5 pieces of dough. Form 1 piece of dough into a 1/2-inch-thick rope on a lightly floured surface. Cut rope into 1/2-inch pieces. In a small sauce pan, bring broth to a simmer. Off heat, whisk in 1/2 cup of butter by adding the pieces a little at a time until the sauce is creamy. Warm sauce on low heat if necessary. Add lemon juice. Add salt to taste and set aside. Add half of gnocchi to a pasta pot of well-salted boiling water and stir. Cook until they float to surface, about 3 minutes. Transfer with a slotted spoon to a baking sheet. Cook remaining gnocchi in same manner, transferring to baking sheet as cooked. Toss with 2 tablespoon of olive oil. Melt 1 tablespoon of butter in 12-inch heavy skillet over medium heat. Add gnocchi in a single layer and cook over high heat until they the bottoms brown, about 2 minutes. Transfer cooked gnocchis to a large mixing bowl and repeat with remaining gnocchis, adding more butter as needed. Warm butter sauce over low heat. Pour over gnocchis and gently mix until evenly coated. Transfer to serving dish and garnish with chopped chives to taste. 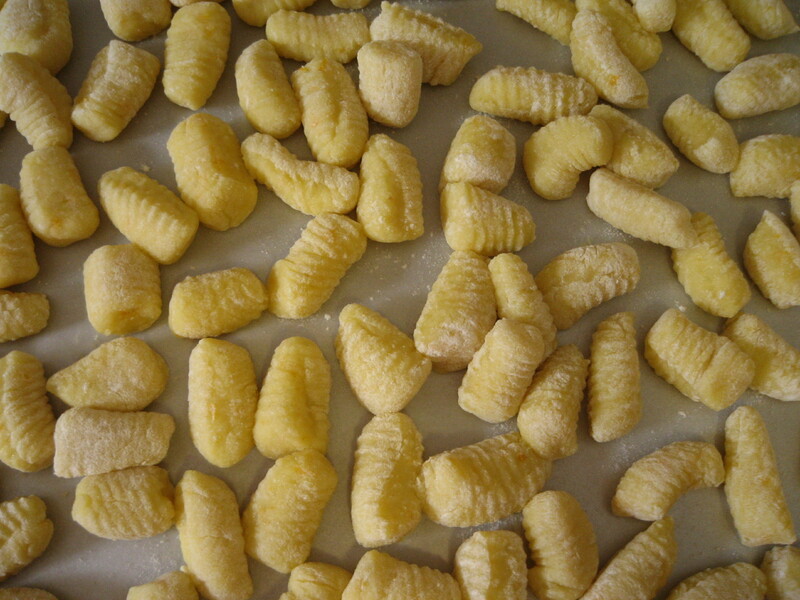 Uncooked gnocchi can be frozen (first in 1 layer on a baking sheet, then transferred to a sealable bag) up to 1 month. Do not thaw before cooking. 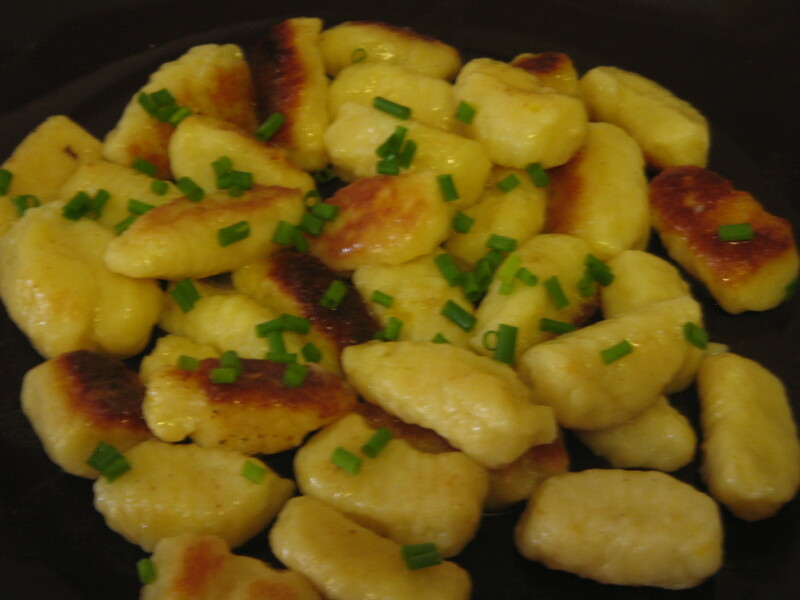 Sauce and topping can be halved; make full recipe of gnocchi and freeze half of it. Click here for more ñoquis del 29. I am soooooo going to Dorie’s pop up store on Monday bright and early. I can walk there from work so I am super excited 🙂 Knowing me, I may stop by there quite a few times during the week. One recipe that is never mentioned anywhere in regard to Uruguay is our famous Carusso salsa ! You can use it over pasta, baked chicken, rice or whatever you like. Melt a couple of butter spoons on a skillet, sautee a minced onion, add a spoon of flour. Add sliced mushrooms, about 100 gms. of chopped ham, and a handful of nuts. Slowly add 2 cups of heavy cream, mixing well, add salt & pepper and a bit of grated cheese. Ready ! I’ll definitely try it and report back! Thank you!